ስለሆነም ከዓለም ባንክ ነጻ “የተጠያቂነት የምርመራ ቡድን” (ኢንስፔክሺን ፓኔል) (ምቡ) ጋር መነጋገር አስፈላጊ ነው፡፡በእርግጥ ምቡ ንጹህ በሚመስል፣በተበጣጠሰ እና ቢሮክራሲያዊ በሆነ የቋንቋ አገላለጽ ይናገራል፡፡ ስሜት ቀስቃሽ የሆኑ እናስሜታዊነት የተሞላባቸው እንቆቅልሽ የሆኑ አስደንጋጭ የሆነየሰብአዊ መብት ተሟጋቾችን ቋንቋ በፍጹም አይጠቀሙም፡፡የሰዎች ሰብአዊ መብቶች በይፋ እየተደፈጠጡ እያዩ ድርጊቱን የሞራል ኪሳራ ብለውአይናገሩም፡፡ ሸክስፒር በሮሚዮ እናጁሌት እንዲህ በማለት ጽፈዋል፣ “እነዚህን እንቆቅልሾች ግልጽ እስከምናደርግ ድረስ ለጊዜው የሞራል ስብዕና ኪሳራንአፍእንዲሸበብ ያደርጋሉ…” ይህንን አስደንጋጭ ሁኔታ እንዲዳፈን አላደርግም ምክንያቱም የዓለም ባንክ የእራሱ የምርመራ ቡድንሁሉንም እንቆቅልሽ የሆኑነገሮች ሁሉ ግልጽ አድርጎልኛልና! የባንኩ ስራ አስፈጻሚዎች ወይም ደግሞ ኃላፊዎች በጋምቤላ ህዝቦች የመንደር ምሰረታ ፕሮግራም ለውጥ አመጣ አላመጣወይም ደግሞ ፋይዳ ያለው ነገርአስገኘ አላስገኘ ደንታቸው አይደለም፡፡ ከዚህም በላይ ስለይፋ የፖሊሲ እና የመመሪያሰነዶቻቸው ስለጋምቤላ ህዝቦች መሰረታዊ አገልግሎቶች ለማቅረብጥናት ሲጠና በፕሮጀክት ትግበራ ሂደቱ ወቅት በአኟክማህበረሰብ ላይ ሊያስከትሉ ስለሚችሉ ጉዳቶች እና አደጋዎች የተጠናና እና በሰነዱ ላይ የተካተተምንም ዓይነት ነገር የለም፡፡የባንኩ ስራ አስፈጻሚዎች ወይም ኃላፊዎች ይህን የመሰረታዊ አገልግሎቶች ፕሮግራም በአራት ክልሎች ላይ በአንድጊዜለመተግበር የመሞከራቸው ሁኔታ ሲታይ ሊውጡት ከሚችሉት በላይ እያኘኩ የሚገኙ መሆናቸውን በግልጽ ያመላክታል፡፡በፕሮጀክት ማጽደቅ ወቅትበባንኩ የፖሊሲ ሰነድ በተራ ቁጥር 2.20 ላይ ከተጠቀሰው ጋር አብሮ የማይሄድ መሆኑእየታወቀ ወደተግባር እንዲገባ መደረጉ የባንኩ ስራ አስፈጻሚዎችወይም ኃላፊዎች ከሚከተሉት ውስጥ አንደኛውን ሊሆኑእንደሚችሉ ያመላክታል፡ የሙያ ብቃትየለሽነት፣ የለየላቸው የስራ ጸር የሆኑ ሰነፎች፣ ለምንም ነገርየማያስቡ ግዴለሾች፣በቀጣይነት በህዝቦች ላይ ሊመጣ ስለሚችለው ጉዳት እና አደጋ የማያውቁ ክህሎቱ የሌላቸው ደንቆሮዎች፣ ምንም ዓይነትደንታየሌላቸው እና የሞራልም ሆነ የሙያ ስብዕና የሌላቸው ለህዝብ መብት ኬሬዳሽ የሚሉ ከንቱዎች መሆናቸውንያሳያል፡፡ መፍትሄውን ከቦርጫቸው ስርተወሽቆ ያገኙታል! በኢትዮጵያ ባሉ የዓለም ባንክ ስራ አስፈጸሚዎች እጆች ላይ ደም አለ! [VII] [ይህ ግኝት የገንዘብ ተጠያቂነት ጉዳይ እስከተነሳ ድረስ እጅግ በጣም የሚያስገርምና የሚያስደንቅ ነው፡፡] በኢትዮጵያያሉ የዓለም ባንክ ስራአስፈጻሚዎች የባንኩን ገንዘብ ከሙስና ለመከላከል የሰሩት አንዳችም ነገር የለም፡፡ ለዚህም ነው“በመጀመሪያ ብቁ ያልሆነ የፋይናንስ አደጋ“ የሚል ሀረግየተጨመረው፡፡ የዓለም ባንክ OP/BP 10.00 እና የትንተና መሳሪያዎች (የህዝብ ወጭ እና የገንዘብ ተጠያቂነት) (ህወገተ) በተቀባይ ክልሎች የሚላከውገንዘብ እንዳይባክንየተዘጋጀው፡፡ እነዚህ ፖሊሲዎች እና የትንተና መሳሪያዎች አጠቃላይ በሆነ መልኩ የሙስናን አደጋ ይከላከላሉ ባይባልምአጠቃላይበሆነ መለኩ ግን ዕቅድ፣ ክትትል እና ግምገማዎች የሚካሄዱ ከሆነ በተቀባይ አገሮች ላይ አዎንታዊ የሆነ ውጤትንያመጣሉ፡፡ በኢትዮጵያ ያሉ የዓለምባንክ ስራ አስፈጻሚዎች ስለገንዘብ አደጋ የህዝብ መሰረታዊ አገልግሎቶች ፕሮጀክት 3ንእንዳለ ለሙሰኞች እና ለዘራፊዎች ትተውታል! እንደ አቡጀዴ ከመቀደድ በላይ የሚያሳፍር ምን ነገር ሊኖር ይችላል ወገኖቼ?! በአሁኑ ጊዜ ያለንበት ዓመት 2015 ነው! ስለዚህ በኢትዮጵያ በአሁኑ ጊዜ ድህነት በ22.2 በመቶ ወርዶ ይታያልን!? አቤትቅጥፈት! ወይ አይን ማውጣት! በእርግጥ የዓለም ባንክ የወያኔ ሸፍጥ እንደሆነ ያውቃል…! ከምንም ጥርጣሬ በላይ በሆነ መልኩ እንደሮኬት እየተተኮሰየሚነገረን የቅጥፈት የኢኮኖሚዕድገት መጣኔ እና ሌሎችም ተመሳሳይ የሆኑ በህዝብ ላይ የሚደረጉ የቅጥፈት አሀዞች ሁሉበመለስ ዜናዊ የቁጥር መመቀያ የስታቲስቲክስ ቢሮ እየተመረቱእየወጡ ለዓለም ባንክ፣ ለዓለም አቀፉ የገንዘብ ድርጅት እናለሌሎችም እንደ ሀገራዊ እና የውጭ ድርጅቶች እንደ በቀቀን እንዲደግሙት በጸጥታ እየወጡየሚሰጡ እና በመጨረሻምመለስ ሁለተኛ ዘገባ አቅራቢ ሆኖ ባዶ የተፈበረከ ቁጥር እየጠራ እድገት ነው እያለ ከረባቱን እና መነጽሩን እያሳመረሲያሰለችንኖሮ በእግዚአብሔር ትዕዛዝ ሲሰናበት አሁን ድግሞ የቅጥፈት ጓዶቹ የሆኑትን ደቀመዝሙሮቹን ተክቶልንአልፏል፡፡ “የመለስ ዜናዊ የቅጥፈት ኢኮኖሚክስ“በሚል ርዕስ አቅርቤው በነበረው ትችቴ ላይ ያቀረብኩትን ትንተና ከዓለምባንክ ወይም ደግሞ ከሌላ በመምጣት ማንም ሙያው እና እውነታው አለኝየሚል ቀርቦ ማስተባበል እንዲችል የመሞገቻመድረክ ለመክፈት ጥሪ አቅርቤ ነበር፡፡ ሙግቴንም ማንም ተቀበሎ ሊሞግተኝ አልቻለም። ሆኖም ዉቸትአንዴት ዉነትንልሞግት ይችላል? እ.ኤ.አ ህዳር 2014 በኢትዮጵያ የዓለም ባንክ የምርመራ ቡድን ዘገባ የሞዮን አባባል የሚደግፍ ንጹህ እና አወዛጋቢ ያልሆነማስረጃ አቅርቧል፡፡ ባለፉትሶስት አስርት ዓመታት ውስጥ ምን ያህል ትንሽ ነገሮች ተለውጠዋል?! ድምጼን ከፍ አድርጌ በመጮህ ምን ዓይነት ግራ የሚያጋባ መርሀግብር ነው የዓለም ባንክ በኢትዮጵያ በመተግበር ላይያለው? ድምጼን ከፍ አድርጌ በመጮህ: አዲስ አበባ ያለውን የዓለም ባንክ ሰራተኞች ቀኑን ሙሉ ሲያዛጉ ነው የሚዉሉት?! የፍትህና የነፃነት ጥያቄያችን ደም በማፍሰስ አይቀለበስም!!! 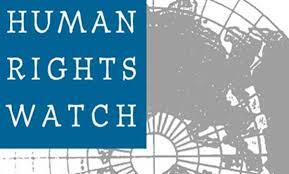 (Nairobi) – The Ethiopian government’s systematic repression of independent media has created a bleak landscape for free expression ahead of the May 2015 general elections, Human Rights Watch said in a report released today. In the past year, six privately owned publications closed after government harassment; at least 22 journalists, bloggers, and publishers were criminally charged, and more than 30 journalists fled the country in fear of being arrested under repressive laws. The 76-page report, “‘Journalism is Not a Crime’: Violations of Media Freedom in Ethiopia,” details how the Ethiopian government has curtailed independent reporting since 2010. Human Rights Watch interviewed more than 70 current and exiled journalists between May 2013 and December 2014, and found patterns of government abuses against journalists that resulted in 19 being imprisoned for exercising their right to free expression, and that have forced at least 60 others into exile since 2010. Most of Ethiopia’s print, television, and radio outlets are state-controlled, and the few private print media often self-censor their coverage of politically sensitive issues for fear of being shut down. The six independent print publications that closed in 2014 did so after a lengthy campaign of intimidation that included documentaries on state-run television that alleged the publications were linked to terrorist groups. The intimidation also included harassment and threats against staff, pressure on printers and distributors, regulatory delays, and eventually criminal charges against the editors. Dozens of staff members went into exile. Three of the owners were convicted under the criminal code and sentenced in absentia to more than three years in prison. The evidence the prosecution presented against them consisted of articles that criticized government policies. 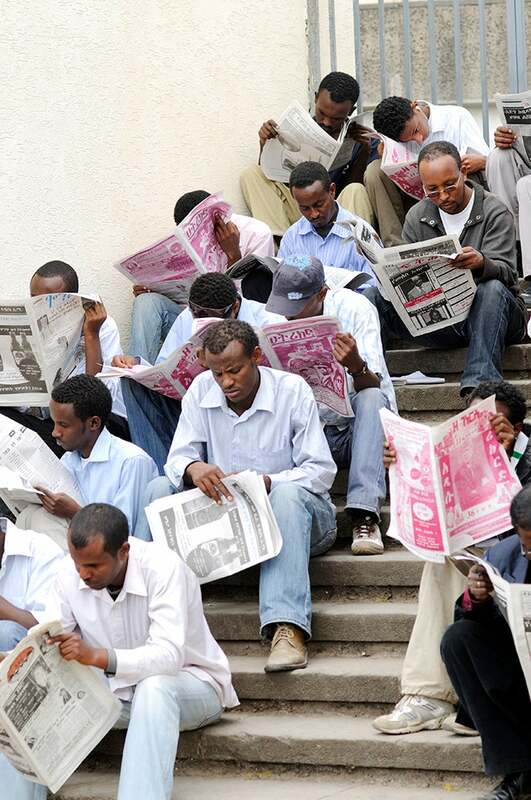 While the plight of a few high-profile Ethiopian journalists has become widely known, dozens more in Addis Ababa and in rural regions have suffered systematic abuses at the hands of security officials. The threats against journalists often take a similar course. Journalists who publish a critical article might receive threatening telephone calls, text messages, and visits from security officials and ruling party cadres. Some said they received hundreds of these threats. If this does not silence them or intimidate them into self-censorship, then the threats intensify and arrests often follow. The courts have shown little or no independence in criminal cases against journalists who have been convicted after unfair trials and sentenced to lengthy prison terms, often on terrorism-related charges. Most radio and television stations in Ethiopia are government-affiliated, rarely stray from the government position, and tend to promote government policies and tout development successes. Control of radio is crucial politically given that more than 80 percent of Ethiopia’s population lives in rural areas, where the radio is still the main medium for news and information. The few private radio stations that cover political events are subjected to editing and approval requirements by local government officials. Broadcasters who deviate from approved content have been harassed, detained, and in many cases forced into exile. The government has also frequently jammed broadcasts and blocked the websites of foreign and diaspora-based radio and television stations. Staff working for broadcasters face repeated threats and harassment, as well as intimidation of their sources or people interviewed on international media outlets. Even people watching or listening to these services have been arrested. The government has also used a variety of more subtle but effective administrative and regulatory restrictions such as hampering efforts to form journalist associations, delaying permits and renewals of private publications, putting pressure on the few printing presses and distributors, and linking employment in state media to ruling party membership. Social media are also heavily restricted, and many blog sites and websites run by Ethiopians in the diaspora are blocked inside Ethiopia. In April, the authorities arrested six people from Zone 9, a blogging collective that provides commentary on social, political, and other events of interest to young Ethiopians, and charged them under the country’s counterterrorism law and criminal code. Their trial, along with other media figures, has been fraught with various due process concerns. On January 14, 2015, it was adjourned for the 16th time and they have now been jailed for over 260 days. The arrest and prosecution of the Zone 9 bloggers has had a wider chilling effect on freedom of expression in Ethiopia, especially among critically minded bloggers and online activists. The increased media repression will clearly affect the media landscape for the May elections,. ዲሞክራሲ እና የኢኮኖሚ እድገት ምን እና ምን ናቸው? The two top notch ESAT (Ethiopian Satellite Television) journalists Mesay Mekonnen and Fasil Yenealem are in Eritrea to gather news and reports about the Ethiopian patriots (freedom fighters), the following pictures are taken from Mesay Mekonnen’s Facebook page. ተለማማጆቹ በህሙማን ላይ የማዘዝ ስልጣናቸው እስከ ምን ድረስ ነው? ለመሆኑ እነዚህና መሰል ችግሮችን እየፈፀሙ የሚገኙትን እነዚህን ተለማማጅ የህክምና ተማሪዎች እንቅስቃሴ የሚከታተል አካል ማነው? ተለማማጅ ተማሪዎቹስ በህሙማን ላይ ያላቸው ስልጣን እምን ድረስ ነው? ከዚህ በተጨማሪም “ተለማማጅ ተማሪዎቹ በታካሚው ላይ የሚኖራቸው የማዘዝ ስልጣን እስከ ምን ድረስ እንደሆነ በግልፅ መታወቅ አለበት፡፡ ይህንንም ራሳቸው ተለማማጅ ተማሪዎቹ፣ የህክምና ተቋሙ፣ የጤና ባለሙያውና ህሙማኑ በአግባቡ እንዲያውቁት ሊደረግ ይገባል፡፡ ተማሪዎቹ ለሚፈፅሟቸው ስህተቶችና ለሚያደርሷቸው ጥፋቶችም ተጠያቂ የሚሆኑበት ስርዓት ሊዘረጋ ይገባል” ብለዋል፡፡ በየሆስፒታሉ በተለማማጅ የጤና ተማሪዎች የሚፈፀሙ የህክምና ስህተቶች በእርግጥም ትኩረት ሊሰጣቸውና ጥብቅ ቁጥጥር ሊደረግባቸው ይገባል፡፡ ችግሩ ህይወትን ያህል ዋጋን የሚያስከፍል ነውና!